I have a dress with some lovely beads sewn on the front, but they started to come off after several wash (although I only do hand washing because we don't have a washing machine). I've tried sewing them back on but some beads have gone missing so I had to take them all off and kept them with my stash of beads collection for future use. 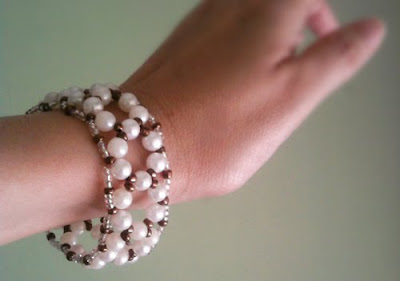 After a few drafts and drawings on the back of some old receipts (yep I use them as note pads), and a couple of trials and errors, I made myself a new pearly bracelet out of those fallen beads from my dress. This one is a slip-on with no hooks or buckles so it's really convenient, and just in time for Christmas! This one is really lovely. Would you consider selling some of your beaded stuff? Thanks Holly, I'm right now only giving them out to friends as little gifts. But that's a thought.